To make the challenge piece I was inspired to make an impression of the Grand Canyon by making strata in a variety of fabrics including upholstery samples. I scoured them by washing in Synthrapol to remove the Scotchguard or Teflon treatment, then piece strips onto a muslin foundation. The work was soaked in soda ash solution then taken out of the solution and placed in the bottom of a rectangular bucket, slightly scrunched. A LARGE bag of ice was dumped over the top. Then several different colours of procion dye were sprinkled onto the ice. Here’s how the strata looked after it came out of the dye bath after 12 hours of soaking. There was still a little ice floating on top of the melted water but I wanted to get on and knew it would take a long time to dry because of the heavier fabrics in the work. 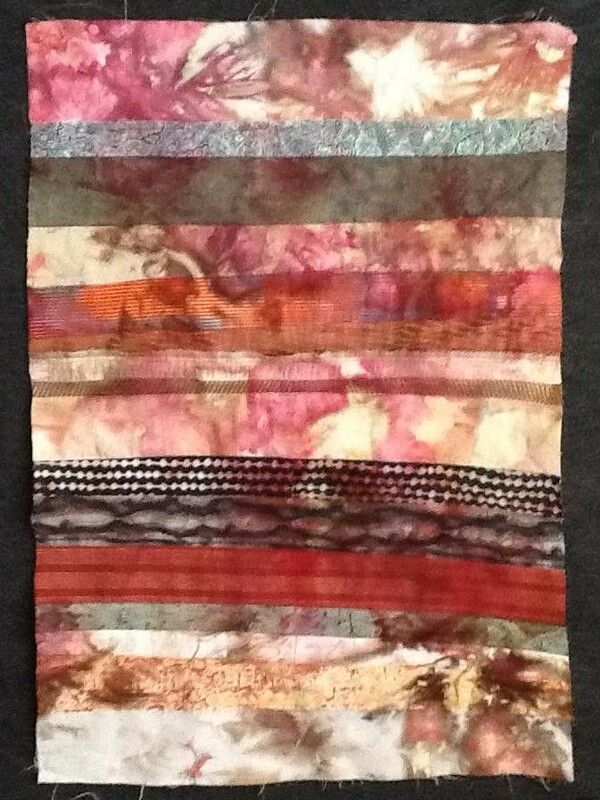 I’m making an art quilt for a challenge so until the challenge is over a month from now not much will be revealed. However I am documenting the process and after the big reveal will post. The piece is ice dyed among other techniques and here is a piece of fabric that will NOT be part of the challenge piece although that was my original plan. They say insanity is doing the same thing and expecting different results. Hmmm. Well I didn’t do EXACTLY the same thing, because in this ice dyeing session I presoaked the fabric in soda ash solution, then squeezed it out and kept the leftover solution for future use. The main piece of work was laid in the bottom of the pail and the muslin shown in this photo was on top. Then everything was covered with ice cubes and procion dye powder was sprinkled over the top. What WAS the same, you ask? 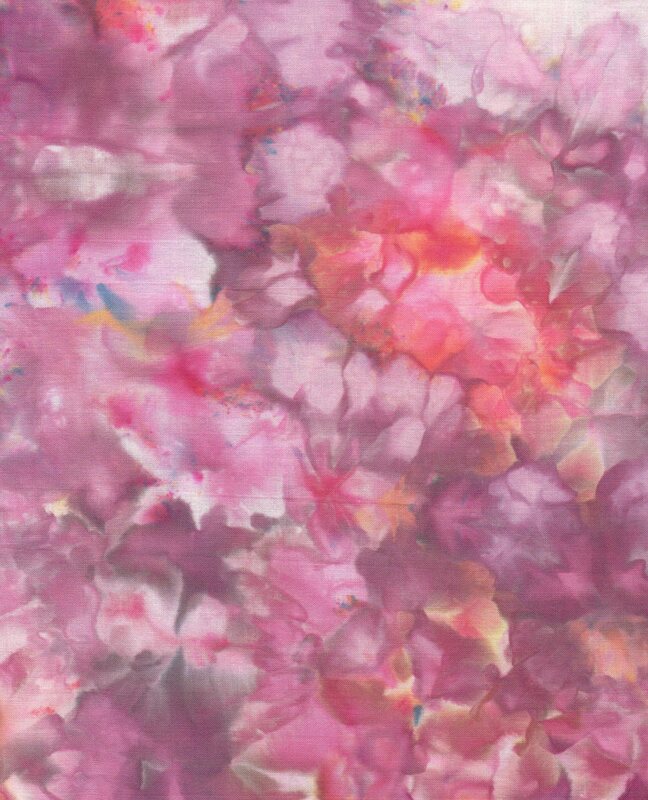 Again, I had thoughts of dyeing muslin to use for binding, but I find I’ve created something too cool to cut. I will find a use for it but it will for sure not be binding! Any and all suggestions for what to do with this are more than welcome. It’s about fat quarter size and this is a scan of some of it. Our quilt guild was recently blessed by a presentation followed by a two-day workshop from Ana Buzzalino of Calgary. 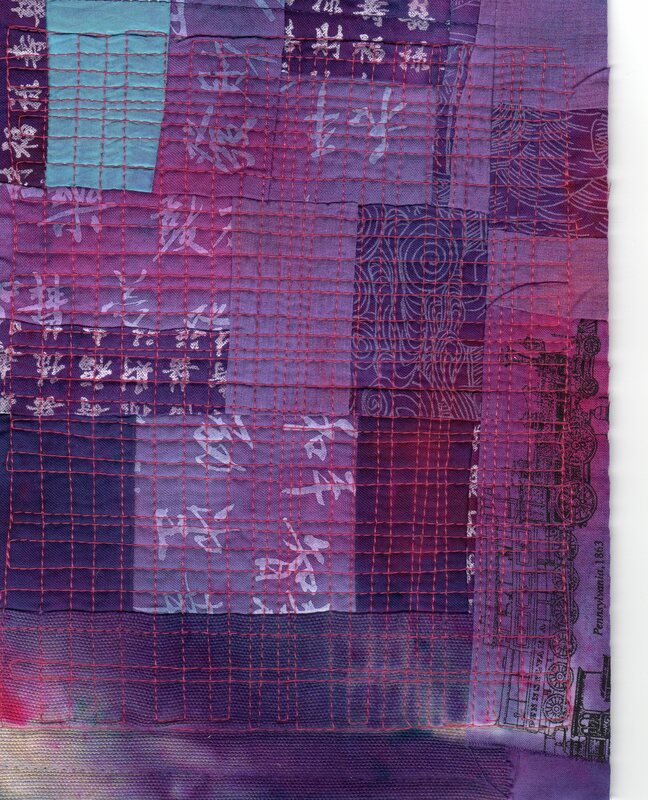 We pieced directly onto a quilt sandwich (backing, batting and muslin foundation) using cotton, poly cotton, and other fabrics that take fiber-reactive dye. I.e. no wool and no pure polyester. Ana is an absolutely inspirational teacher and although my machine was not behaving terribly well I felt brave enough to attempt free motion quilting and curved piecing. In fact, as often happens in life, the challenge with the machine led to a serendipitous find. I left the workshop to drive straight to Sawyers where Denise identified and fixed no less than three issues, so no wonder I was frustrated! Anyhoo, they had a table full of polyester serger thread in all colours. The polyester doesn’t reach with the Procion dye so you can choose the best colour for each project. Before the workshop I had been somewhat challenged to find even white polyester thread. Having finished a piece in the course of the workshop I left buzzing with ideas of other things to try. Ana’s supply list was to bring suitable mixed fabrics in light and neutral colours, all of which pick up the dye a little differently. For the second project which we began as our quilted projects were steeping in the dye bath, Ana gave us some pure polyester turquoise fabric (think bridesmaid dress!) and some lilac poly cotton. I’m still working on that, because I added in a bunch of black and white prints and it’s grown and grown. 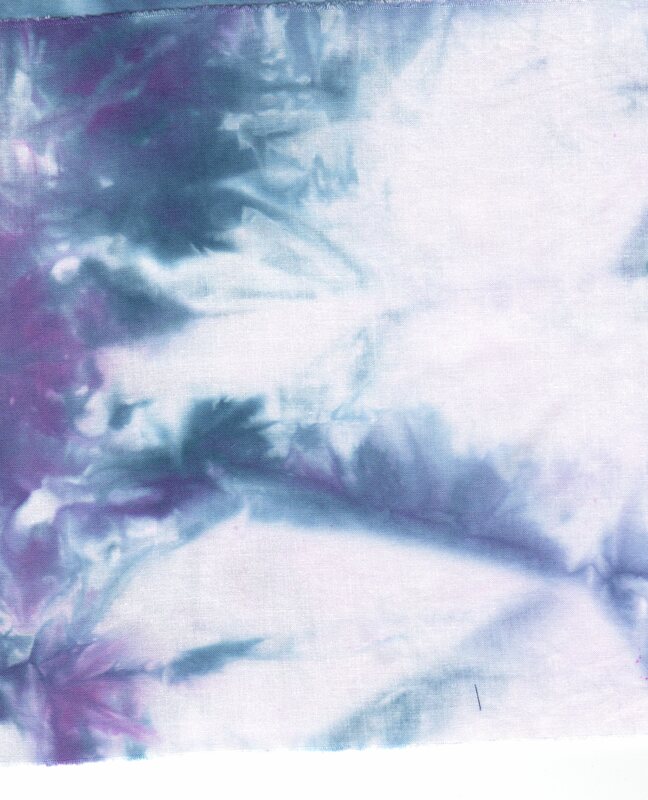 I decided to make a small experimental piece and ice dye it so instead of it being one colour all over you would get a marbled/mottled effect. So I used some of the turquoise and lilac, plus other black and white fabric, and an upholstery sample which I prewashed with Synthrapol to remove the Scotchguard treatment. Ana is big on using fabric with writing on it, which is another thing I enjoy working with, so I used two fabrics with Chinese script on it. The dark purple one in the photo started out neutral; the lighter one with the larger characters started out hot pink. I think this must have made the fabric less able to pick up other dyes. So the front is the last photo, quilted with fuchsia polyester which stayed the same colour. 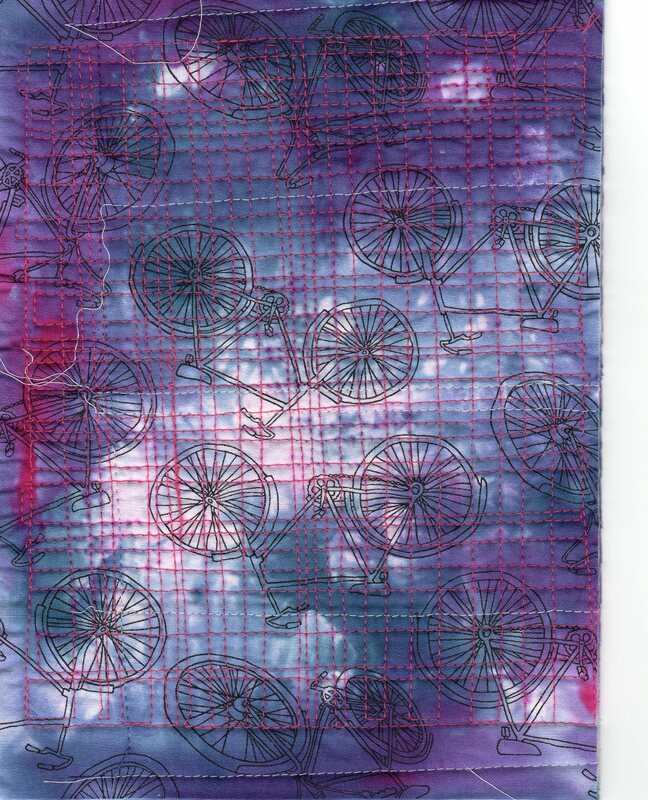 And the back was a cool bicycle print! At the workshop Ana reminded up to throw some plain muslin into our dye bath so we’d have the exact right shade of binding. I placed a piece under the quilted piece, covered everything with ice, and sprinkled the powdered procion dye over the top of everything (navy, fuchsia and grape). However much as I love what happened with the intended binding piece it’s too light to work as binding. (see photo, which is navy and white basically). Fortunately I have a dark purple fabric with YET MORE Chinese script! Which will be the binding. Lesson learned, next time I’ll put the binding over the top of the quilted piece so it’ll hopefully be nice and dark yet the piece will still look good.